We are incredibly sorry to inform you that our systems have been hacked and probably hacker has taken away all the database we had on our live server. We are working hard to secure our servers and even negotiating with the hacker to prevent further leaks and to assess the extend of breach. Our affiliate system is badly affected as it is evident that the passwords were stored unencrypted as plain text with over 3,500 accounts, it is severely compromised and we are getting in touch with all the affiliate account holders to secure their other sites with common password. We are contacting affected customers directly. If your affiliate password is common with other services, please Change them now!. Read our mails carefully for updated info. If you have any questions, please ask in the comments below or email Arvind directly at arvind@joomlart.com. We're going to update this article to keep you posted about the breach. All passwords except those on affiliate system are encrypted and we will reset passwords for all sites the very moment we are sure of our server security. An email is sent out to all of our affiliate users to inform about the incident and suggest a course of actions should be taken. PDF file hosted on warez site taken down by hacker, post negotiation. Hacker persuaded to desist from further leaks and co-operate to secure user information. We spent more than 12 hours to get in touch & discuss with the hackers. 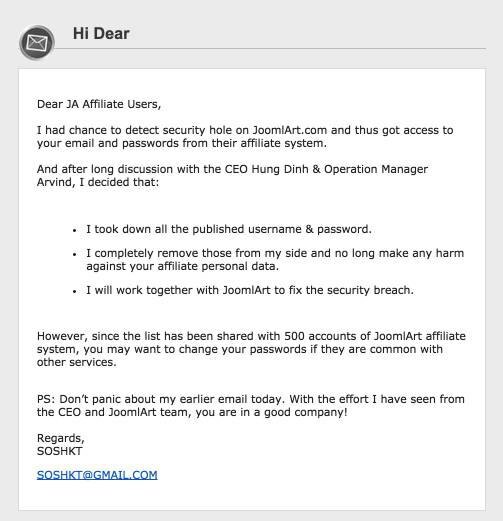 This is the email that all our affiliate users received a few hours ago. This mail is sent to our affiliate users.